Treatment of a rotator cuff tear often starts with a good effort at conservative therapy. The success of non-surgical treatment options depends on the type of rotator cuff tear (acute versus longstanding), the size of the tear, and the activities of the patient. In more than 50% of patients with a rotator cuff tear, non-surgical treatments will be effective at relieving their symptoms. In some people, however, pain and function will continue to be limited, and a surgical procedure may be recommended. These are some of the surgical options for treatment of a rotator cuff tear. Prior to the development of arthroscopic surgery, all rotator cuff tears were repaired by looking directly at the torn tendon through an incision about 6 to 10 centimeters in length. The advantage of open rotator cuff repairs is the rotator cuff tendons are easily seen by this method. It is straightforward to repair the tendons down to the bone, and many surgeons find this a more secure repair. The downside is that the incision is large, and the recovery can be longer and more painful. Often the deltoid muscle, the large muscle over the outside of the shoulder is damaged or even partially detached. This damage to the deltoid muscle can cause pain and prolong the recovery. The mini-open method of repairing a rotator cuff involves an arthroscopic portion of the surgery, and a short incision to get direct access to the torn rotator cuff tendon. By using the arthroscope, the surgeon can also look into the shoulder joint to clean out any damaged tissue or bone spurs. Preparation for the rotator cuff repair can be performed arthroscopically. Once the arthroscopic portion is complete, a shorter incision is made to repair the tendon back to the bone. The incision used in a mini-open rotator cuff repair is about 3 cm, and the recovery may be less painful than the open cuff repair. Like the open rotator cuff repair, there is some trauma to the deltoid muscle, but never detachment and the damage is less significant. An arthroscopic rotator cuff repair is done through small incisions, and the repair is done with the surgeon looking through a small camera to see the torn rotator cuff tendons and their repair on a television monitor. This is a more recent development in treatment of rotator cuff tears, and not all types of tears can be treated by this method. Furthermore, arthroscopic rotator cuff repairs can be technically difficult and require experience in this method of repair. 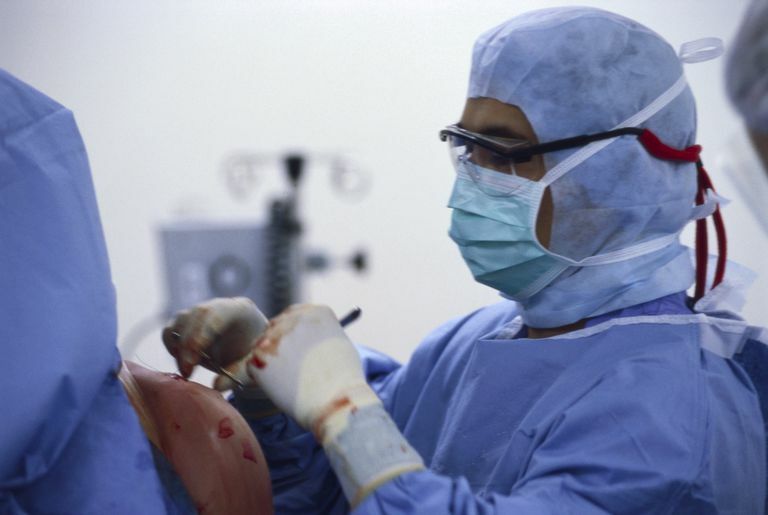 Not all surgeons are convinced the repair done arthroscopically is as strong as repair done through an open incision. The deltoid muscle is left with very little damage after all arthroscopic rotator cuff repairs. In large rotator cuff tears that have been neglected for a number of years, the cartilage of the shoulder joint may eventually wear out. These very large rotator cuff tears are often called massive rotator cuff tears and involve at least 2 of the 4 rotator cuff tendons. This is a problem called rotator cuff tear arthropathy and is a dual problem of shoulder arthritis and a large rotator cuff tear. Because the rotator cuff is no longer intact, a standard shoulder replacement is usually not adequate. Special implants help accommodate for the fact that the rotator cuff does not work normally. One of these special implants is called a reverse shoulder replacement. Rehabilitation after rotator cuff surgery is as important as the surgical repair. Without proper rehab, the chance of full recovery is small. Rehab after rotator cuff surgery is a balancing act. On one hand, the goal is to regain the strength of the shoulder. On the other hand, the tendons must be protected to allow for adequate healing of the tear. A skilled therapist can help you perform appropriate activities, and your doctor will let you know when to progress with each step of your rehabilitation. The specific progression of rehab following surgery can depend on a number of factors and can be very different from patient to patient. While you may hear from friends about their rehab progression, each individual can have very different levels of pain and progression back to activity. Your surgeon should be able to give benchmarks for your particular progression. Burkhart SS and Lo IK "Arthroscopic Rotator Cuff Repair." J. Am. Acad. Ortho. Surg., June 2006; 14: 333 - 346.